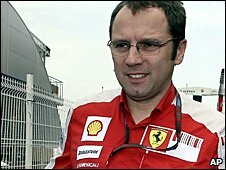 Ferrari boss Stefano Domenicali insists their decision to sign up conditionally for the 2010 Formula 1 season does not mean they will accept a budget cap. Ferrari and the eight other members of Formula One Teams Association (Fota) have submitted a joint entry dependent on conditions being met by 12 June. One condition is that they can operate under current technical regulations. Domenicali said: "Making the 2009 regulations the starting point means there will be no budget cap." Ferrari had threatened to quit F1 after 60 unbroken years of competition if the International Automobile Federation (FIA) did not change the rules for the 2010 season which included an optional £40m budget cap. But Ferrari's decision to enter conditionally was seen as greatly reducing the likelihood of their departure from the sport. However, if the conditions, put forward by Fota members Ferrari, McLaren, BMW Sauber, Toyota, Renault, Red Bull Racing, Toro Rosso, Brawn GP and Force India are not met, Domenicali pointed out the answer was simple. "If the conditions are not met, the entries will be invalid," he said. The FIA is due to publish the official entry list for the 2010 season on 12 June. Williams were suspended from Fota after signing up for next season on their own last Monday.